A letter carrier’s job is a daily challenge. Letter carriers must use both mental and physical faculties to get their jobs done under deadline while overcoming all sorts of obstacles. Though it’s not always obvious, the union has a large impact on letter carriers’ daily lives. NALC’s advocacy efforts, past and present, are aimed at assuring letter carriers are treated and paid fairly in accordance with the National Agreement, the law and other applicable agreements and regulations. These efforts extend from the shop steward level to the regional and national staff. 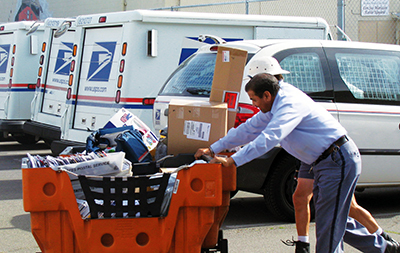 When disputes arise, NALC is there to handle them, whether they involve a single carrier or thousands. NALC works with both carriers and management to make a carrier’s job safe, but if a carrier is injured on the job, NALC is there to help the carrier get the benefits he or she deserves. And NALC works to protect retirement benefits and help carriers at the end of their careers get the benefits they earned after years of hard work. This page is the hub for finding information on workplace issues and how NALC represents letter carriers in the workplace. The fastest way is by searching for your issue in the search bar below, or using one of the search terms on the left. Check out the sections explained below, which are filled with the latest news and resources to help you deal with issue at the postal workplace. Many resources and documents relating to workplace issues are available on this site, including the National Agreement, the Joint Contract Administration Manual, the Materials Reference System and many handbooks, manuals, agreements and MOUs, paycharts, decisions, laws and regulations, NALC publications and others. 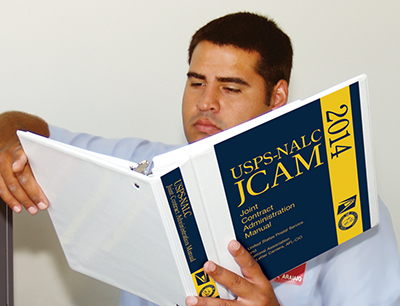 The Contract Administration Unit (CAU) at NALC Headquarters oversees contract enforcement efforts at the highest level. The group of several NALC officers and staffers, headed by the NALC vice president, oversees the grievance-arbitration system, files, discusses and attempts to resolve Interpretive Step grievances involving issues of contract interpretation, offers advice and support to the national business agent offices in NALC’s 15 regions and compiles and publishes information resources for NALC contract enforcers at all levels of the union. NALC’s Director of City Delivery is responsible for following issues concerning the structure of letter carrier work—the structure and adjustment of carrier routes and working methods used by carriers in delivering the nation's mail. NALC’s Director of Safety and Health is responsible for following safety and health issues that relate to letter carrier jobs. NALC’s Retirement Department assists retired letter carriers regarding their benefits under the Civil Service Retirement System (CSRS) and the Federal Employees' Retirement System (FERS). The department also provides help and advice to survivors of retired letter carriers. If you are a letter carrier who has been injured on the job, click here and follow the instructions to get information about your rights and benefits. Information about Customer Connect, a joint effort by NALC and the USPS to increase revenues through letter carrier leads headed by NALC's executive vice president, can be found here. The NALC Guide to Identifying Intentional False Editing of Clock Rings was created to assist union representatives when investigating grievances concerning clock ring edits that impact letter carriers’ pay. Cases settled concerned the rules when employees are excessed into the letter carrier craft outside of their original installation, and the effective date that coverage begins after selecting a health benefit plan following conversion to career status. Newly converted CCAs are “new employees” who, under ELM, must complete 90 days of service before they may take or be credited with annual leave; M-39 Handbook Sec. 126.3 does not “directly relate to wages, hours, and working conditions” under Article 19. The NLRB has formally charged USPS with failing to bargain with NALC over the potential impact on letter carriers of September’s cyber-security breach that compromised Postal Service computers containing workers’ personal and employment information. On March 17, the Postal Service was made aware of a suspicious parcel addressed to President Barack Obama. In light of this event, a Mandatory Safety Talk was provided to the NALC. The Bureau of Labor Statistics has published its Consumer Price Index update for January 2015. The NALC and the Postal Service have settled national level case Q06N-4Q-C 11084998 concerning whether the maximization provisions of the MOU Re: Maximization/Full-time Flexible – NALC apply when an installation is under Article 12 withholding. The Bureau of Labor Statistics has published its Consumer Price Index update for December 2014. The Bureau of Labor Statistics has published the Consumer Price Index for November 2014.